It was a grand occasion commemorating the start of a grand project. On Saturday, Nov. 26, 1904, a cornerstone was laid near the southwest corner of Third and G streets for a new Eureka City Hall. The two-story Italian Renaissance-style building, to be built on the site of the old Pioneer School after a vote to levy a tax to pay for construction, was designed by San Francisco architect Joseph W. Rowell. It would house all the city offices along with the police and fire departments, with a jail in the basement. It would be "a building which will stand for years to come as a monument of the awakening of civic pride in Eureka," noted in The Daily Humboldt Standard. The newspaper reported that the ceremonial placement of the cornerstone was done as a rite of the Masonic order, with Grand Master G. W. Hunter, up from San Francisco for the occasion, assisted by the Grand officers pro tem of the Grand Lodge of California and Humboldt Chapter of Masons. As the ceremony began, the block of Madera County granite -- 30 inches square and 9½ inches thick, inscribed "A.D., 1904" -- was suspended in mid-air with block and tackle decorated with small American flags. After a prayer and a song by a choir, Eureka's mayor turned things over to the Masons. Dressed in full regalia adorned with gold, Grand Master Hunter gave a stirring speech praising the choice of location for the building on an old school site. He went on to say, "The government of cities is one of the great problems of the age. In many places there is graft and corruption, but here in Eureka, I'm glad to say the city's affairs have been honestly administered and the officials have used their best judgment on all occasions. For this beautiful edifice we must thank the Council and the newspapers and commend the wisdom of the people in voting money for it." 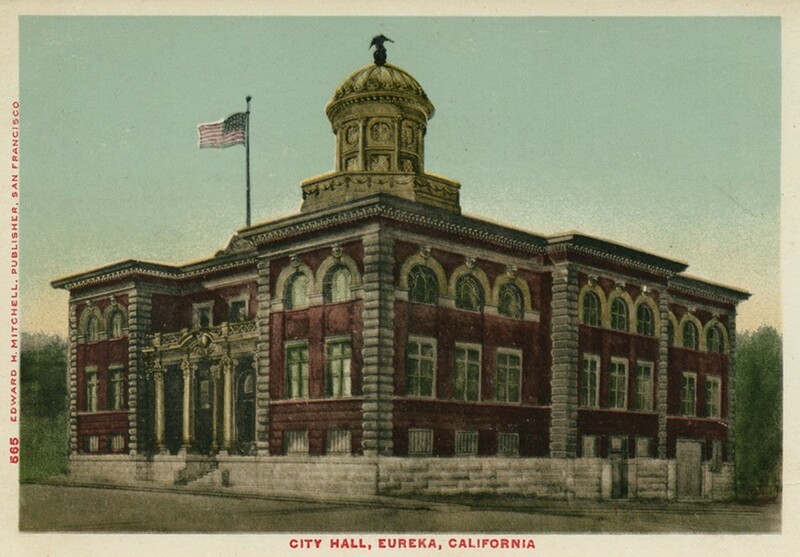 After heaping on further praise for the city's lack of crime (thanks to the many the fraternal organizations) and noting that "San Francisco papers no longer locate Eureka somewhere in Oregon," he placed the stone and anointed it with wheat, oil and wine poured from silver ceremonial vases. Finished about a year later, the city hall was used from 1906 until 1954, when an earthquake rendered much of it unsafe. In 1960 the building was demolished. A parking lot took its place. However, at the insistence of the Masons, the cornerstone was saved, housed in the collection of the Clarke Historical Museum. Now, through a partnership among the City of Eureka, Eureka Main Street and the Eureka Heritage Society, with assistance from the Clarke, Humboldt Masonic Lodge No. 79, and contractor Bill Lenhofff of Cornerstone Construction, the cornerstone will be placed once again, not far from where it stood for 56 years. It will serve as the base for a monument carrying a plaque commemorating the old Eureka City Hall building. The public is invited to attend the ceremonial rededication at 11 a.m. Saturday, May 19, at the corner of Third and G. Once again, ceremonies will be conducted by the Grand Lodge, Free and Accepted Masons of California. This time Most Worshipful Frank Loui, Grand Master, will preside.